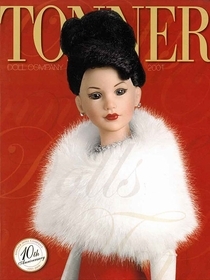 Beautiful catalog printed on glossy, high quality paper - full of beautiful color photos of all dolls, outfits and accessories in the 2000 main Tonner Doll Company collection - excluding Tyler which was a separate catalog that year. 49 pages of charming and dramatic poses on high quality, glossy, paper. Catalog is filled with 18" Kitty Collier Collection; 8" Tiny Betsy McCall; an extensive collection of all the characters in the Betsy McCall family; Kripplebush Kids; ; 10" & 18" Ann Estelle Collections; For Better or For Worse Collection and Cloudland Playdolls. Catalog includes background stories and descriptions.